The reverse side of this coin tells the story of the beginning of the space age. 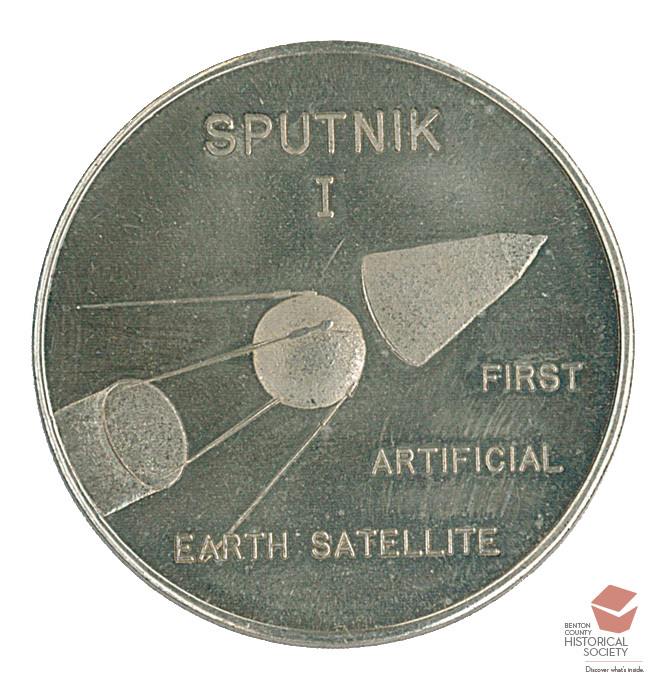 "On Oct. 4, 1957, the first artificial earth satellite Sputnik I  was launched from the U.S.S.R. It separated from the booster rocket at 9:04 Greenwich mean time and went into orbit around the earth. Sputnik I traveled in space at 17,712 miles per hour and completed an orbit of the earth every 90 minutes at a distance that varied from 140 to 560 miles above the earth." This event caused an uproar in the United States. Although the U. S. had earlier announced it would launch an artificial satellite as part of 1957-58's International Geophysical Year, the televised failure of the first launch of the Vanguard rocket combined with the Russian success led people to fear the U.S. was falling behind in the cold war technology race. The result was the formation of the National Aeronautics and Space Administration (NASA), an accelerated space exploration program, and increased spending on mathematics and science education.